Alpine Silk Hydra Plus Replenishing Placenta Day Crème with Aloe Vera and SPF 15+, enriched with Placenta and the addition of Aloe Vera, this natural crème soothes, softens and enhances the skin while restoring natural vitality. 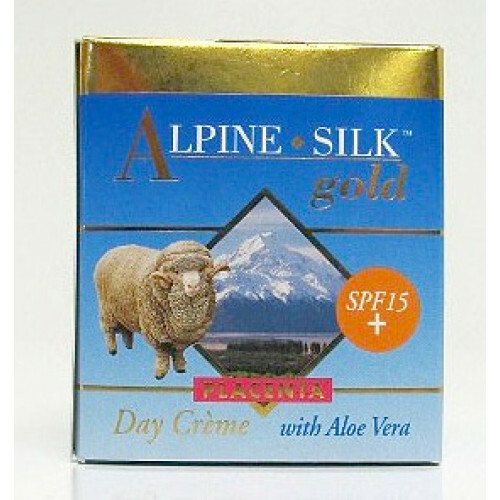 SPF 15+ has been added for extra protection against harmful UV rays. A luxurious natural formulation to pamper your skin. Smooth crème evenly over the face. Deionised Water, Aloe Vera, Octyl Methoxycinnamate, Isodecyl Oleate, Glycerol, Benzophenone-3, Cetyl Alcohol, Acetylated Lanolin Alcohols Mineral Oil, Stearic Acid, Placenta Extract, Butyl Methoxydibenzoylmethane, Titanium Dioxide, Isopropyl Myristate, Triethanolamine, Phenoxyethanol, Tocopheryl Acetate, Methyl and Ethyl and Propyl and Butyl Paraben, Carbomer, Fragrance.